I recently came into the possession of a wonderful little notebook. The book was used by a shop in 1919 to record customer purchases bought on credit. Sample page from shop notebook recording credit purchases. The notebook which is an example of the wonderful penmanship, provides a list of the purchased and cost of goods. It also provides a glimpse into rural life in 1919. 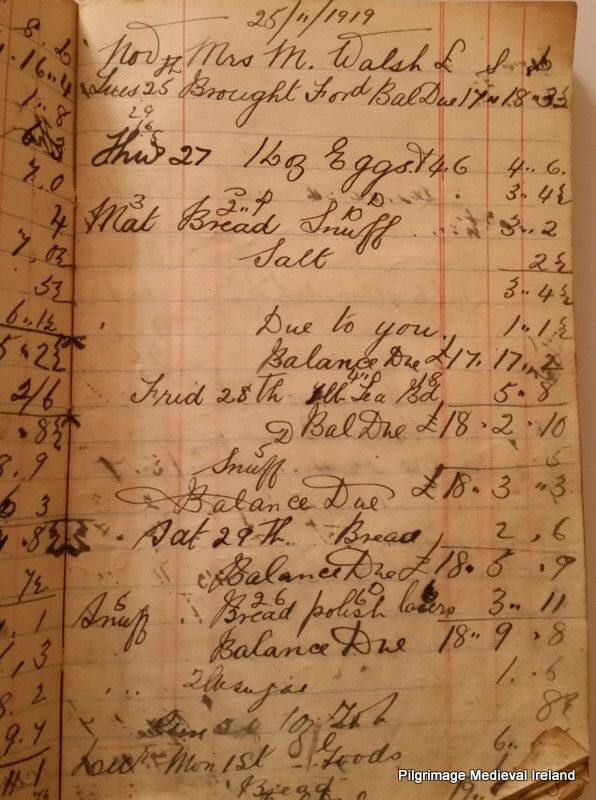 The main purchases were candles, matches, salt, tea, bread, tobacco, cigarettes, snuff and pipes with occasional purchases of eggs, starch, pipes, and polish. It’s easy to forget that people in rural Ireland would not have had access to electricity in 1919. Although many towns and parts of cities were supplied with electricity prior to Independence many people did not get electricity until the 1940s and some till the 1970’s (Mac Philib 2011). So its easy to see why candles were on everyone’s shopping list. In modern Ireland we all know the dangers of smoking tobacco, so I was surprised to see cigarettes , tobacco and snuff mentioned so often and purchased by approximately 99% of the customers. Snuff a rarity today was especially popular and turns up on almost every page of the notebook. Some people purchased it along with cigarettes. I wasnt sure exactly what snuff was. I remember an elderly neighbour who I used to visit as a child taking snuff which she kept in a small tin in her apron pocket . According to Wikipedia Snuff is a smokeless tobacco made from ground tobacco leaves. It is inhaled or “snuffed” into the nasal cavity and was very popular . Reading this book also made me realize how self-sufficient people were. There is never a mention of dairy products, vegetable or meat. In rural Ireland most people had access to milk and butter they produced themselves and they also would have grown their own vegetable. No mention of treats such as chocolate or coffee which I certainly couldnt live without. This entry was posted in Folk traditions, Uncategorized and tagged rural Ireland 1919, Shopping in 1919. ← A St Brigit’s Day Tradition from Tipperary: St Brigit’s Ribbon (ribín Bríghud). Fascinating! This was still being done when I was a child in the 1950s. My mother bought groceries on credit and paid at the end of the week. Cigarettes would have featured in her order too! Thanks Finola delighted to hear your story too. Fascinating how times have changed.